Collen Bros (Quarries) Ltd is a family owned and operated civil engineering company located in Portadown, County Armagh, Northern Ireland. We supply to and carry out work for both the private, commercial and public sectors. 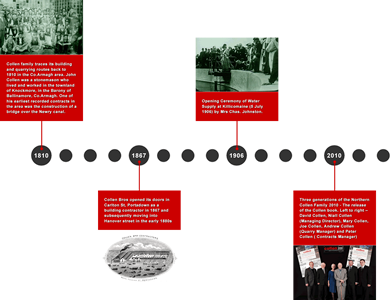 Collen Bros (Quarries) Ltd will be very soon launching a timeline of events detailing over 200 years history of our company.